')"> Tata Motors Ltd recently launched the Tata Aria, a never before seen crossover concept from the homegrown company. Before this however, the company also launched another new for the company, the Tata Xenon XT car. This was a pickup SUV or er truck.Their first attempt at the pickup region was done way back with the 207Di and then some more with the TL 4×4. The former was a hit until other feature rich and modern cars came its way. The latter was too rugged and something which the urbans stayed away from. The Tata Xenon XT was first displayed at a Motor Show namely the Bangkok Motor Show and surprisingly it was launched in Thailand first and then in Italy before coming to India. It would be an understatement to say that people are crazy about the Tata Xenon in Thailand whereas in Italy it lags just behind Toyota in the pickup region. To make this pickup look a bit urban and rugged, Tata Motors took help from Concept Group which were a dowry package for the marriage with Jaguar Land Rover group. Concept Group is based in England and is also credited with the looks of the Tata Sumo Grande. Once I got my hands on the Tata Xenon XT, I was raring to go and have a spin in it. Recounting my adventures with Tata Xenon XT review below. This vehicle is actually a tribute to the old Tatamobile however in flesh no one could take a guess if it is actually a hand me down from the old vehicle. This vehicle has a front end resembling the Tata Sumo Grande a bit. It has a big grille with the Tata logo sitting in the middle. It has rectangular head lamps which sit quite snugly with the grille. The bumper is also neatly integrated and has a small air dam to go with it. The fog lamps are housed in their own separate units and look classy. The windscreen is not as highly raked as the other cars from its stable. It has a front skid plate which gels well with the lifestyle SUV image that Tata Motors want to project for this car. This car is wider than even the BMW X5 and longer than the current generation Audi Q7 in India. It is based on the old TL’s chassis which has been reinforced for the more modern vehicle. The 205/80 R- 16 tyre size does justice to this vehicle however they don’t quite fill up the butch wheel arches nicely. The outside rear view mirrors are in body color and are the same units from the Tata Sumo Grande. There are standard roof rails to go with the package. The rear end features a huge Tata embossed logo and triangular tail lamps with a tug type of rear door handle. The reflectors are also spill partly to the sides. There is a big step up at the rear to get into the rear cabin. Surprising is the fact that on the options list, for the bonnet, it features a very Aussie outback style deflector, front bull bars, aluminium side steps, chromed rear bumpers and a carrier roof rack. The disappointing fact in any Tata Motors car, the interiors. For the Tata Xenon XT in India, Tata Motors haven’t tinkered with the interior trim. They have kept it the same as the one for the European market. This means that we Indians also get higher quality materials. Alas! We couldn’t be more wrong. 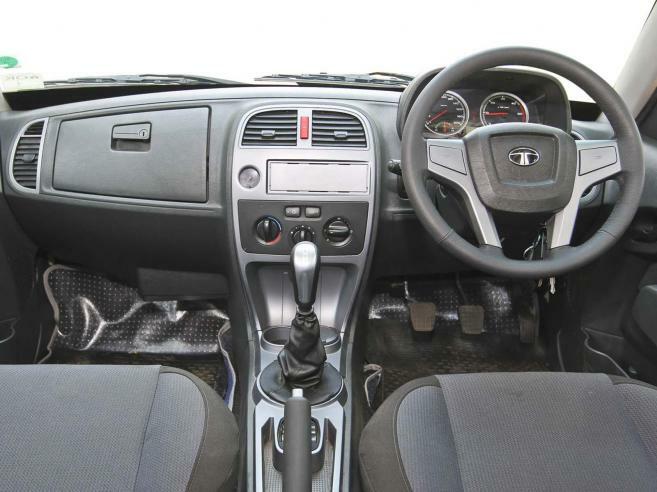 The interiors of the Tata Xenon XT in India are like the same as on the Tata Indigo Manza. It isn’t in the same ball park as the Tata Aria. It may be due to the fact that the Aria was launched later and all the technological developments went into this car. Inspite of the 200 mm ground clearance, clambering into the cabin isn’t hard. A tiny button near the driver’s knees denotes the control for the Borg-Warner 4WD system. The dashboard is typical Tata unit and doesn’t seem distracting enough for a second look. All the controls feel logical to use along with the 4 spoke steering wheel borrowed from the Tata Sumo Grande. Three rotary knobs control the AC. Conspicuous by its absence is the stereo system. The dials are different than any other Tata. The steering wheel is circular and chunky to hold but not adjustable for reach even though rake functionality has been given. There are many cubby holes though and the finish though seems fair than the other Tata cars apart from the Tata Aria which has exceptionally good finish for a Tata car. Space though isn’t premium and there is abundance of it at the front. There is no seat height adjust but still there is a good all round view from the cabin. Comfortable is the word that would come to your mind once you plonk yourself into the seats. The rear seats are not much off from the bench mark set by the front seats. The only hindering feature is the upright back rests which may be a problem while going all the way in the wild. The load bay can carry around 500 kgs of luggage and boasts of a 1320 cc of space. A canopy can also be added above the load bay to protect the cargo from rain, sun and of course been stolen from a country like India. Ride quality is the plus point of any Tata Motors offering however not so for the Tata Xenon XT in India. This is because it features a rear live axle, leaf springs, and an independent front suspension. The body construction is ladder on frame chassis and this car makes no bones that it is a true off-roader. True to its off –roader name, the car rides well after it is fully loaded. The ride when the car is not loaded to its gills is somewhat bouncy especially at low speeds. This car doesn’t like even sharp bumps as well. However the ride quality is far better than its only competition in the Indian market and that is the Mahindra Scorpio Getaway. The suspension tuning is far superior to the one done in the Mahindra. Its suspension setting seems more crude in the off-road scenario as can be expected from pickup vehicles. Talking about handling, this 5.2 meters leviathan is a bit of chore in the crowded lanes as also in the forest. Its steering is direct but still has some vagueness about it. It is however one of the better tuned units from the Tata Motors stable. This car features a 4 wheel drive system and a limited slip differential.It even gets traction control. The handling is very predictable and though it wouldn’t corner like a BMW, it still doesn’t roll as much as the Mahindra Scorpio Getaway. Speaking of NVH, it is nicely controlled however once past it torque band, this motor becomes quite raucous. Pottering around in town doesn’t make one realize that the motor is laboring hard away to keep the vehicle moving. The 4 wheel drive system is easy to engage at speeds of 65 kmph whereas the low ratio can be only engaged while the vehicle is in stand still. I though wished that Tata Motors should have provided the car with much beefier tyres. The Tata Xenon XT in India features the same engine as found in the Tata Safari Dicor. This 2.2 liter diesel engine or DICOR in Tata speak makes 140 Ps of peak power and 320 Nm of maximum torque. It is enough to propel this vehicle from 0-100 kmph in 16 seconds flat and achieve a top speed of 157 kmph. The car even on part throttle moves forward with a sense of urgency. The 5 speed gear box, a Tata trademark, is still rubbery in its feel and execution. Turbo lag is minimal and the variable geometry turbo aids the engine in this. Access to the huge torque is available from as low as 1700 rpm. The power band though is narrow and extends only till 3200 rpm. It is also 310 kgs less than the similarly motored Tata Safari and hence feels more lively to drive. Tapping this performance is the 4 wheel disc brakes aided with ESP, ABS and traction control. The brake pedal modulation however left much to be desired though and I would suggest Tata Motors to fix this gremlin at the earliest. It requires more than a shove to achieve respectable stopping distance. Safety is taken care by three point seat belts for all the passengers, collapsible steering column and also 2 air bags for the front passengers. Coming to the all important fuel efficiency, I expected it to be more than the Tata Safari however somehow this car returns only 9.6 kmpl in the city and 14.2 kmpl on the highway, less by 1 kmpl than the Tata Safari. It is however more than the Mahindra Scorpio Getaway. Tata Motors are planning to launch niches and ones which other manufacturers would definitely follow through. They first launched the world’s cheapest car, the Tata Nano. Then came the quality revolution with the Tata Indica Vista and Manza. 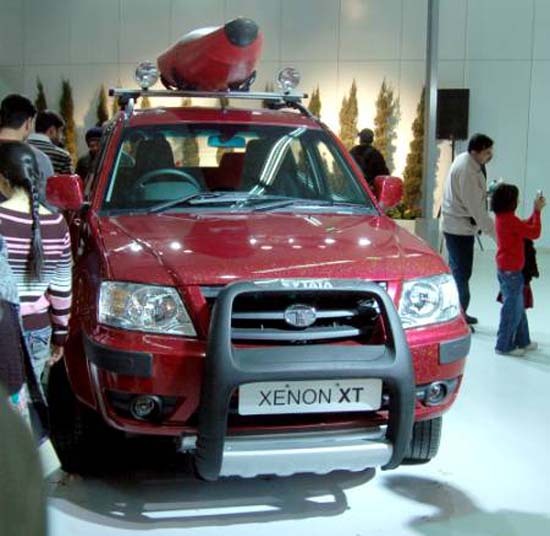 Later on the Tata Xenon XT was launched. Finally the Tata Aria also came into being. The Tata Aria heralded the start of the new quality materials from Tata Motors. The Tata Xenon XT in question now is one of few vehicles which wouldn’t sell well in the Indian market. The primary reason is no many think that a pickup truck is a good idea in India. It may sell well in the rural areas though. The farmers would have an alternative to their tractors for bringing in the farm produce. Urban people would appreciate the utility and flexibility offered by this vehicle. This is been promoted as an urban, upmarket lifestyle vehicle and this would mean much to those adventure seeking, moving away from the run of the mill work individuals. It has got the Tata Motors service backup and a fairly reliable DICOR engine under its hood. There are some gremlins though and those would be the still yet to be desired cabin quality, slightly more refined engine and the final thing, the sticker price. There are two trim levels been offered. The Tata Xenon LT retails at Rs. 8.57 lakh rupees for the base variant and Rs.9.14 lakhs for the 4 wheel drive variant Tata Xenon XT. A costly indulgence indeed but it may not matter for those high heeled people out there in India.